And the winner of my first ever blog give-away is Karen! 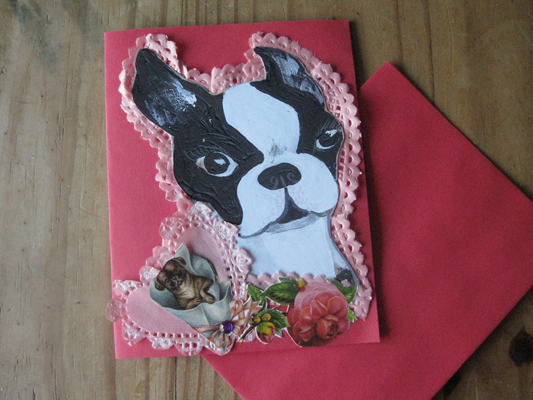 Karen, you will receive a Boston Terrier valentine (per your choice)!!! Your card will be similar to but not identical to the one shown below. Thank you to the 3 other contestants and to Angela at Sew Loquacious for sending over one of them! I hope you will all stay tuned for future transmissions from this corner of blogland and let your friends know too! Congrats to Karen for winning your sweet card. Thanks for your Gracious comment Donnie! Perhaps you will be the winner in the future... I plan on doing bunches of these! Congratulations to the winner! She's a lucky gal! I am so excited to win one of Liza's incredible cards! Thank you, thank you! And Happy Valentine's Day to you all!